Hello and welcome!! Some of the design team have created layouts today for Scrappy Monday at My Creative Time. We were challenged to pick a letter and create a layout around items that start with that letter. I picked the letter O......can you spot the things in my layout that start with the letter O?? I cut the cute 'O'wls out with my Cricut and the Hoot n' Holler'n cartridge. I used some 'O'vals in my layout under the title and also along the left edge of the layout. 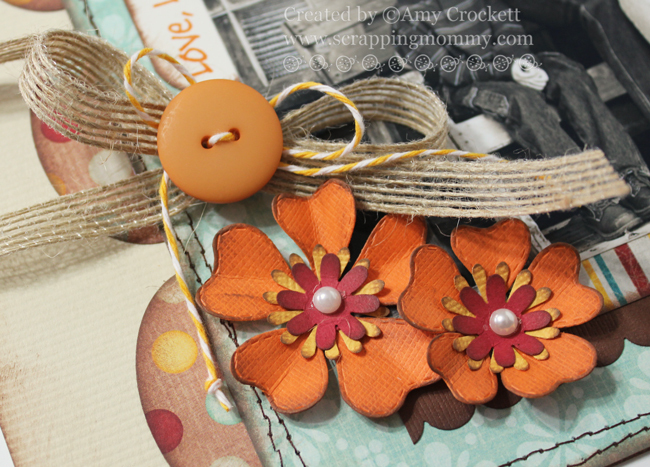 I used 'O'range cardstock for one of the layers as well as with the fab Flower Petal dies from My Creative Time. I also did some stamping with Orange and the Just Simply Live stamp set. My kiddo's also pointed out that the layout is of 'O'ur Family and that we had the pictures taken in 'O'ctober. Super clever of them to notice that!! I hope that you will hop on over to the My Creative Time blog to check out the fab layouts done by the other design team members for Scrappy Monday. Oval punch, corner rounder: Stampin' Up! WOW! This Layout is beautiful! I love the owls,the distressing and the stitching!! Beautiful!! 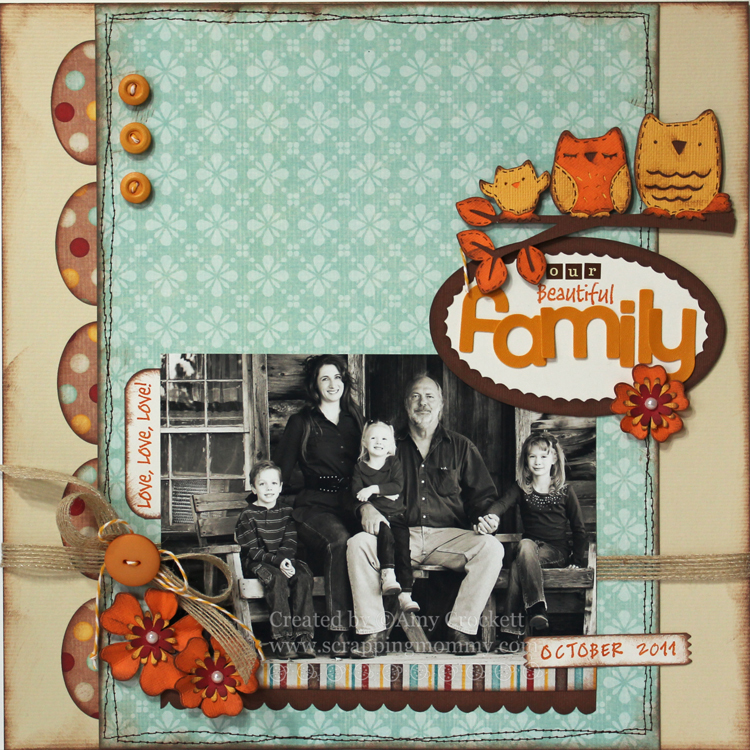 Beautiful family and layout! Thanks for sharing! O-dorable!!! 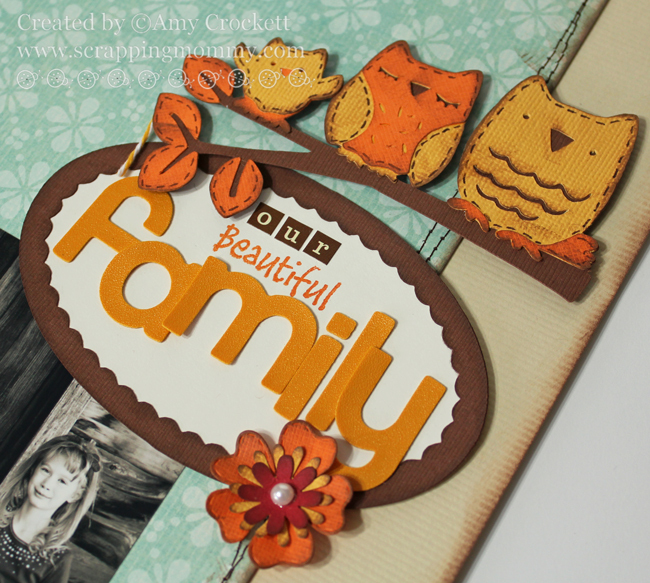 Love the stitching and the pretty papers you used for all of your elements! What a fun layout! I love the colors. Great use of your letter. Those little owls are to die for...thanks for sharing...love it! Cute LO I love how it looks like an old fashioned pic. Just everything you put with it is so perfect it has that yester-year western feel. Great Job!! Oh my gosh...this layout is gorgeous!! Love the colors and the owls...so so pretty!!! What a beautiful layout!! Love the photo of your family..how neat. Great job with all of the "Os" Love that your kiddos noticed the Our Family & October..how cute! Great job on your letter O layout. The colors are perfect together...so complimentary to eachother. The kids are pretty sharp at finding the o's. I love this layout! It is so pretty! You have a beautiful family! oh my goodness Amy, this is stunning! Amy ~ I LOVE this picture of you and your BEAUTIFUL family!!! How ADORBS!! Okay this LO is simply AMAZING!! I LVOE that you did the picture in black and white and add all those FABULOUS colors and details to it! This is simply STUNNING!!! AWESOME job ~ as always!! !